With good margins and a fast ROI, contour cutting is a great way for in-plants to add value by creating new types of products. At University of Oklahoma Printing and Mailing Services, David Price pulls off the trim from the edges of a contour cut piece. John Sarantakos doesn’t beat around the bush when he explains why it’s so important for in-plants to diversify. John Sarantakos stands next to...himself — or a contour-cut print of himself, printed on foam core and cut with precision by the University of Oklahoma’s Colex Sharpcut automated flatbed cutter. 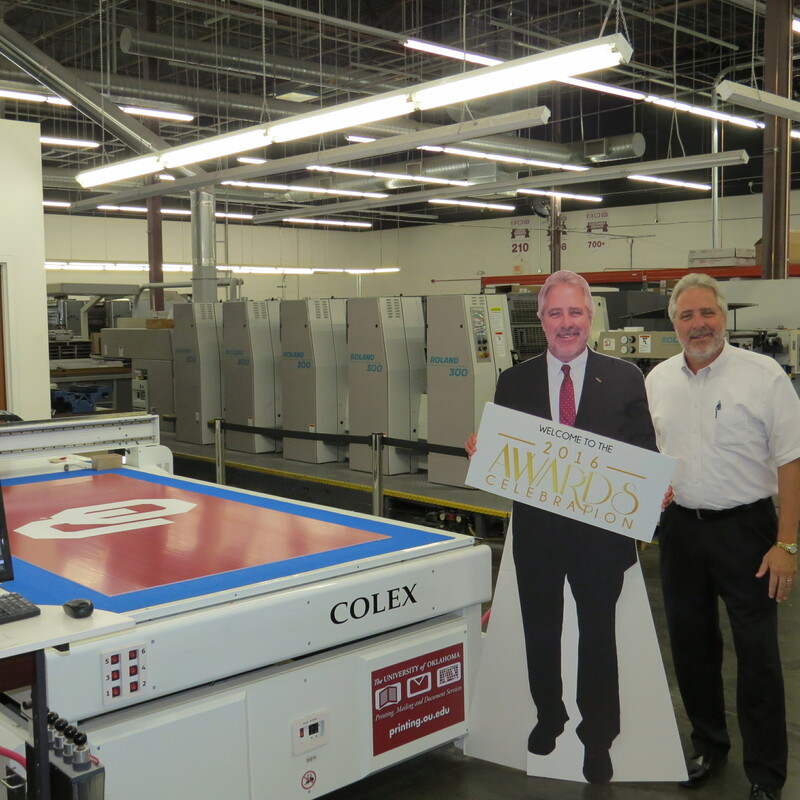 This lifesize image of the director of OU Printing, Mailing & Document Services was created by the in-plant to welcome attendees of its recent awards ceremony. It also shows off the shop’s contour-cutting capabilities, just one of the value-added services in-plants are adding. His in-plant has done a great job of adding services to satisfy the needs of its customers. One of those is contour cutting, which the in-plant added three years ago when it installed a Colex FBC5X10 flatbed cutter. “My assistant director, Sherri Isbell, went to an SGIA show in Las Vegas several years ago and saw first-hand how these devices worked and pitched the idea to me,” explains Sarantakos. “I had seen them at Graph Expo in the past, and at that time our volumes did not justify the expense. The early units were extremely expensive and well out of our price range.” Eventually the benefits outweighed the cost, though, and the University of Oklahoma took the plunge, which has paid off ever since. More recently, Iowa State University Printing and Copy Services purchased a 64˝ Graphtec FC8600-160 cutter in March of 2017. Iowa State University added a Graphtec FC8600-160 cutter to produce vinyl graphics for campus vehicles. Thole had been introduced to contour cutters while holding a previous position in the printing industry, so the capabilities of the cutter were already well-known by the time the in-plant considered getting one. He says the department was made aware of another small campus unit providing products produced with these cutters while on a tour. The abilities of the machine impressed the team so much so that the school went out and bought one. 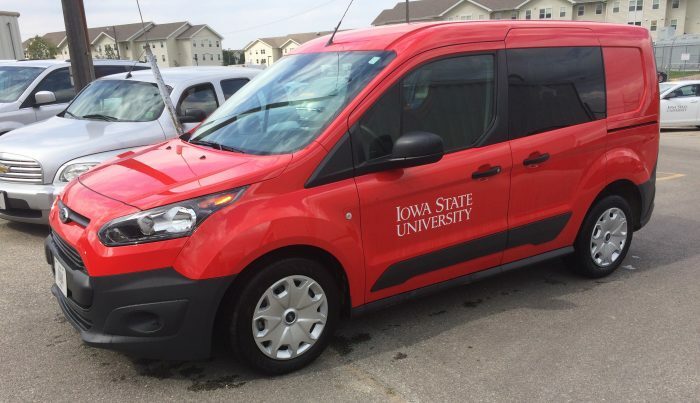 The primary purpose for Iowa State’s cutter was for the Transportation Services department, which has a need for vinyl graphics for all of its campus vehicles. Printing and Copy Services can also cut custom stickers, which have become increasingly more popular. Julie Pardus-Oakes prepares the Graphtec FC8000 cutting plotter to cut out graphics printed on wallNOODLE. Up in New Hampshire, a different need inspired a large order of contour-cut decals, printed on an adhesive, easily removable substrate from MACtac called wallNOODLE. “Our housing department welcomes each incoming freshman class with UNH ‘swag’ upon their arrival,” notes Roberts. “When we made them aware of our contouring capabilities, they ordered nearly 9,000 wallNOODLEs, with half of them cut on the Graphtec. A similar order was received for the following years’ freshman class. While the University of New Hampshire does have a nominal charge for cutting, the in-plant really uses its contour cutting capability as a tool to drive sales of its wide-format products. Once the word got out that the University of Oklahoma’s in-plant had a contour cutter, yard signs were the big request to promote various campus events and activities. The Printing and Mailing Services Department did some intense marketing where it showed examples of how signage could be enhanced by using unusual shapes. As a result, the in-plant has been printing and cutting out Big Heads, life-size cutouts of people and characters, vinyl signage, engraved wooden signs, ADA-compliant plaques, stickers, labels, boxes, point-of-purchase displays, coasters, kiss-cut labels, table tents and more. He’s also happy with the fast return on investment (ROI) of the cutter. “It has already paid for itself with regard to customer service,” Thole notes. At the University of Oklahoma, the margins and ROI have also been great. To see the latest contour cutting and other wide-format technologies, mark your calendar for the 2018 SGIA Expo, Oct. 18-20 in Las Vegas.